What is grass fed meat? As we have learned to raise our own meat chickens over the past few years we have learned a few key rules to follow to get really great quality chicken meat. When I first started to learn about raising meat chickens I was astounded to discover that chickens eat grass and other plants. I thought they just ate grain. In fact chickens have a very diverse diet and when they get access to this diversity you get happy healthy chickens and then the best meat. 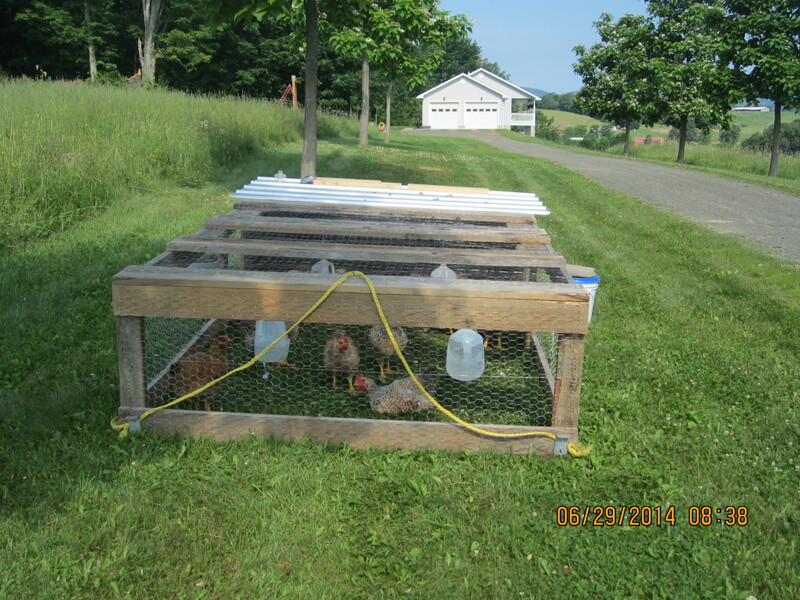 We raise our birds in portable pens that are moved every day so they have access to fresh grass and bugs. This also gives them a very clean environment at all times which means very sanitary and low odor. We give them a good quality grain ration that has all the nutrients they need and we aim to give them grain that is not genetically modified (GMO). After we have raised our own meat birds, the store bought chicken seems awful. Conventional chicken now tastes bland and we are always wondering what is really in that meat. Fortunately more and more people are demanding quality natural chicken meat and so there are more people raising meat chickens on pasture. 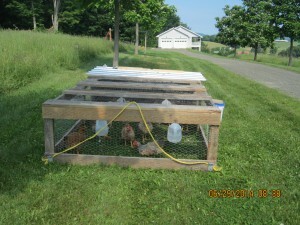 We raise our own terrific meat chickens and would be interested in raising birds for others. We raise our meat chickens from May to October and you can check out our store for more details. Even if you don’t live near us and are looking for a good company to ship you quality chicken meat you can see a few of our hand picked company’s that do an excellent job of raising all natural chicken meat as well as other kinds of meat at our where to buy grass fed meat page. I welcome any questions or comments below. My wife and I just ate one of your pasture raised chickens , it was delicious, my wife said it was the best chicken she ever ate, I agree, delicious! So glad you enjoyed the chicken Tim! Thanks for the feedback. Thank you for this wealth of information about raising free range/natural chickens. It is quite difficult in this country UK, to purchase a chicken that has had a natural life, eating and foraging for itself. I only wish we had someone like you in our area. We would be using your services regularly. Thanks Ches! It is sad that good food is not accessible for everyone, but I hope that education will bring awareness and then bring quality producers. The wheels of progrss turn slowly but education speeds things up. Hope you can eventually find quality food in your area. God bless! Thank you for your article on pasture raised chickens. After reading your article, that makes me a little nervous about what might be in the chickens that I purchase for my family at our local grocery store. How long have you been raising chickens? Do you have any information on what is given to chickens that are not treated as well as those you raise? Check out the where to buy grass fed meat page. Thank you for your article on pasture raised chickens. After reading your article, that makes me a little nervous about what might be in the chickens that I purchase for my family at our local grocery store. How long have you been raising chickens? Do you have any information on what is given to chickens that are not treated as well as those you raise? Thanks for the comment. You may want to look at our post about what is in chicken meat as that describes what is in commercially raised chicken meat and yes it is scary. Buy local from people you can trust. Interesting information here. Like you, I always assumed chickens just ate grain as well. Who knew they ate grass?! I love how you take so much care in raising your chickens. I’ve seen so many documentaries about the horrid conditions of the chickens raised by some of the major companies. It’s heartbreaking. Good to see you provide them with fresh food and a clean environment. So pleased you like the information here Mike! I was like so many other people in the fact that I had no idea what goes on to get food to our table and when I started looking behind the scenes I saw that our commercial food system is a train wreck that is pushing out unsafe nutrient depleted food that isn’t fit to eat. When we choose to raise food the right way the difference was incredible. I hope many more see the truth about food like you have. Thanks for stopping by! ******** Do you shop at Amazon? Did you know that 6 to 8 percent or more of your purchase price goes to marketing companies? If you click here from our site you will be supporting our family farm with the money that would normally go to a marketing company and it doesn't cost you a thing. Thanks! What is in chicken meat? It is more important than ever to understand what is in our food and buy locally in season whenever possible. Thanks for visiting! God bless!